When it comes to fine dining in Gion, it’s often a trip to the unknown. But starting from a name you can read even if you don’t know any Japanese, Gion Calf offers a fine dining experience that is a bit out of the ordinary in Gion, and in a good way. So while their dishes are up to the incredibly high-quality standards expected in Gion, the experience is not as stiff as you might expect, but instead, it’s about having fun eating some excellent food, and even better wagyu steaks. One thing you may also expect from Japanese fine dining is very small portions, but don’t worry; at Gion Calf the portions are definitely big enough, all though to the dessert. The name Gion Calf doesn’t only come from calves, but it’s actually also an acronym taken from the words Cordial, Appetite, Luxury, and Feast. So you can expect all this from Gion Calf! While they do have an a la carte menu, the best way to experience Gion Calf is to order the full course. The course starts with an amuse-bouche, then you get to choose your appetizer from three options, then you get soup with bread, and the main event of the course, the steak, can be chosen from either fillet or loin. After this you get a rice dish, dessert, and coffee, so there is a lot to eat in this course. In the picture you can see sashimi carpaccio. We have been to some pretty great wagyu places in Kyoto, but the way the meat here is cooked on a bed of garlic was a revelation. Be sure to ask some of the garlic as a side, as both it, and the steak, are both just divine. You can choose your special Ohmi cattle steak from either a chateaubriand steak which is roasted under a cover on a teppanyaki grill, or a grilled loin cut steak. What better way is there to start your meal at Gion Calf than with a toast of champagne? The experience here is thought out thoroughly, so you can be sure that the drinks here don’t lose out to the strong tastes of their dishes. When you have some of the best steaks in the world, it would be a shame not to drink some red wine when enjoying the juicy steak. At Gion Calf they change their wine menu for lunch and dinner, to better suit the tastes of the dishes. 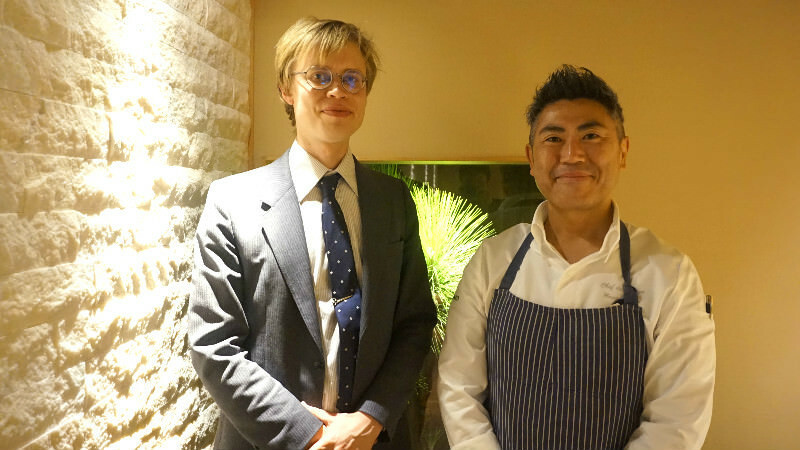 At Gion Calf, you can make small talk with the chef, Naoto Masu, so the atmosphere is relaxed. You can even take a picture with him as a memory of your culinary experience at Gion Calf! Everyone is welcome to Gion Calf, so even those with small children can enjoy wagyu beef! If I had to describe my dining experience at Gion Calf with only one word, it would have to be memorable. I can still remember the taste of the steak I had at Gion Calf really well. The beef here is juicy, but the juices don’t overflow from the steak when you cut it; the steak is firm but when you bite into it, it just melts in your mouth. Getting the full course here is definitely worth it, as you get to eat dishes you normally wouldn’t even consider possible. The sashimi carpaccio I had here was topped with both salmon roe and caviar, and I’m pretty sure I’ve never tasted fish that tasted as good as the carpaccio here. Lunch: 11:30 a.m.-2:00 p.m. Dinner: 5:00 p.m.-10 p.m.
Sundays. These dates may change when its the high season in Kyoto, so we recommend asking the restaurant beforehand. A relaxed, English-friendly restaurant offering some incredible beef in Gion.